Three years have elapsed since the synergetic development of the Beijing-Tianjin-Hebei (Jing-Jin-Ji) region was first put forward as a major national strategy by Chinese President Xi Jinping in February 2014. Xi called for the coordination and integration of the economic zone surrounding Beijing. Now, a fledging Capital Economic Circle is taking shape. The planned area encompasses Beijing, Tianjin and part of Hebei Province, a cluster inhabited by over 100 million people—three times as many as that of the Tokyo megalopolis—and covering a total area of over 200,000 square km. In the past three years, an array of breakthroughs have been made in establishing the economic circle, which represents an answer to a number of urban diseases currently afflicting Beijing, such as traffic jams and air pollution. 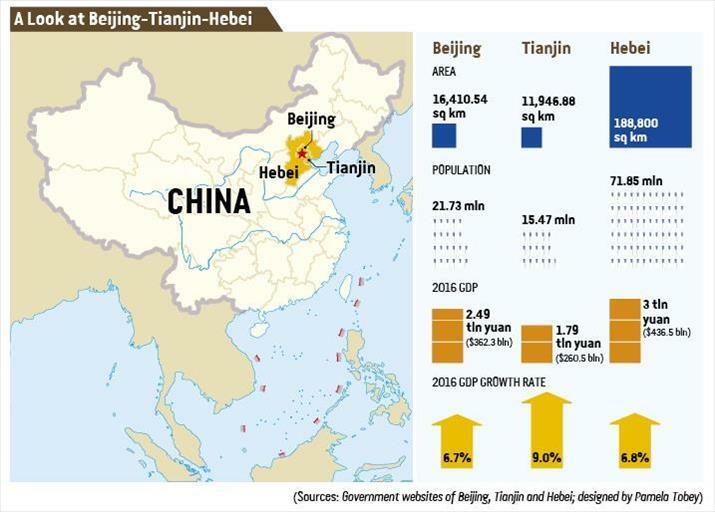 In 2016 alone, investment in the synergetic development of the Jing-Jin-Ji region exceeded 340 billion yuan ($49.58 billion), with Beijing building its sub-center, Tianjin actively promoting transportation interconnection, and Hebei finishing a number of tasks in areas related to integration. As an important backup to the development of Jing-Jin-Ji, an integrated transportation grid encompassing expressways, railways and public transportation is gradually forming. It is expected that all regional dead-end highways will be completely interlinked by the end of this year, including 12 highways such as Beijing-Taipei, Beijing-Kunming, Beijing-Hong Kong-Macao, and ring roads in the capital area will be connected with the overall transportation grid. Besides this, a one-card, integrated public transportation system has so far covered 11 cities. By the end of the year it is expected that people will be able to use a single card for bus and subway travel across the whole Jing-Jin-Ji region. In November 2016, the National Development and Reform Commission promulgated a plan to establish an intercity railway network in the Jing-Jin-Ji region that aims to shorten the travel time between surrounding small towns and satellite cities and the capital itself to less than an hour by train. With extended sections of the Tianjin-Baoding and Beijing-Tianjin railways now complete, it takes merely an hour to go from Tianjin to Baoding and from Beijing to the Tianjin Binhai New Area, instead of the previous three hours. "Next, the three involved parties will fix their attention on lowering public transportation costs to encourage traffic and business flow," said Tianjin Mayor Wang Dongfeng. This suggests that Beijing and Tianjin authorities may consider canceling highway tolls and introducing a high-speed railway monthly ticket system. 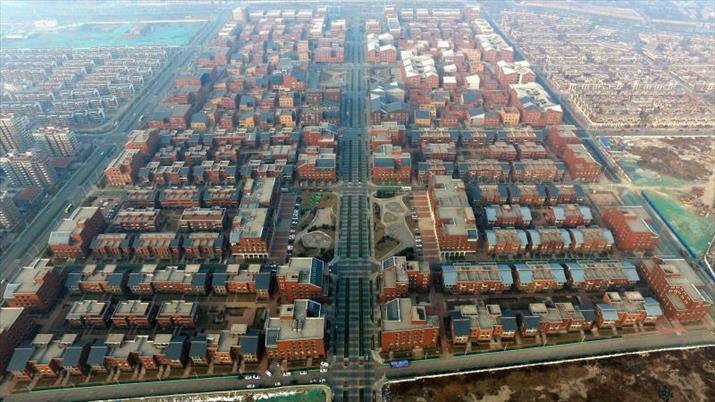 The Jing-Jin-Ji region has simultaneously witnessed the formation of a complementary industrial pattern. In the past three years, a total of 1,341 highly polluting manufacturing enterprises have been shut down in Beijing, and roughly 350 commodity transaction markets have been adjusted or moved out of the capital. 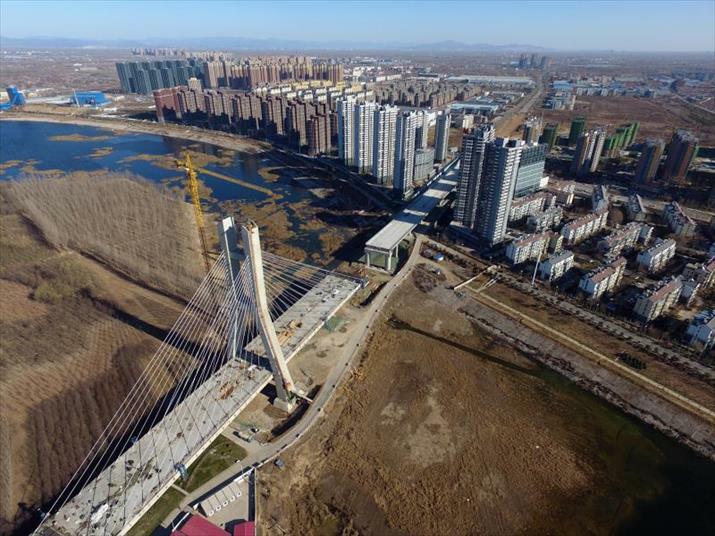 Wang Haichen, Executive Deputy Director of Beijing's Leading Group for Beijing-Tianjin-Hebei Integrated Development, noted that Beijing is not shaking off its burdens through the integration, but eyes long-term development for the Jing-Jin-Ji region. Over the past three years, Beijing has shut down 1,341 companies that consumed large amounts of energy and water and produced high levels of pollution, instead of relocating these so-called low-end companies to Tianjin and Hebei. Beijing intends to transfer part of its high-end manufacturing capacity, which lacks a comparative edge in the capital, to Tianjin and Hebei," said Wang Haichen. According to Wang Haichen, in doing so, Beijing is also exporting cutting-edge technologies to nearby cities. 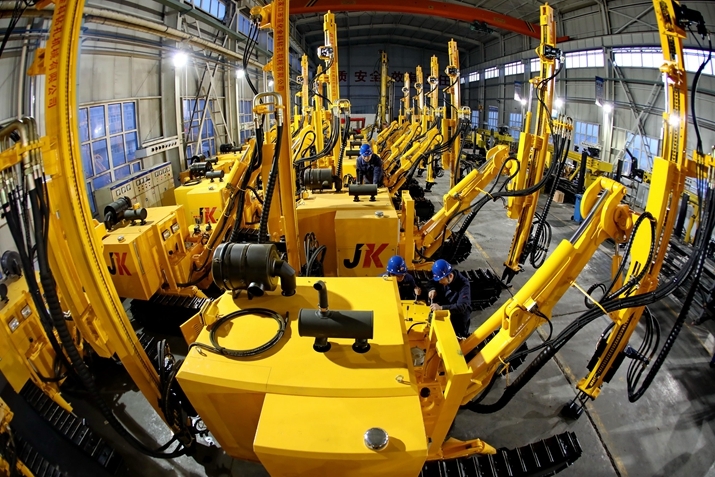 In 2016, the value of technology exports from Beijing to Tianjin and Hebei stood at 15.4 billion yuan ($2.25 billion), up 38.7 percent year on year; paid-in investment made by Beijing-based enterprises in Tianjin and Hebei grew 26 percent and 100 percent, respectively; Hebei introduced 4,100 projects from Beijing and Tianjin, with total investment amounting to 382.5 billion yuan ($55.78 billion), according to data from the Beijing Municipal Commission of Development and Reform. "The manufacturing industries in Beijing, such as the mobile phone and automobile sectors, are relatively lighter and more advanced compared to those of neighboring areas. Therefore, the vitality of Beijing's manufacturing can radiate to Hebei and transfer more jobs to the province," Zheng Xinye, Deputy Dean of the School of Economics at Renmin University of China, told Beijing Review. He noted that the high-value-added and energy-efficient manufacturing sectors that Beijing transfers to Hebei can help the province optimize its industrial structure. Jointly tackling air pollution is another major task facing Beijing, Tianjin and Hebei. In 2015, Tianjin reached agreements with both Cangzhou and Tangshan in Hebei in jointly preventing and controlling air pollution. More specifically, in 2015 and 2016, the governments spent 400 million yuan ($58.3 million) each year on improving coal-burning facilities and coal-fired stoves. Meanwhile, progress has been made in promoting the replacement of coal with electricity and natural gas, and the use of coal-fired stoves has been completely eliminated in the main urban zones of Beijing, Tianjin and Baoding and Langfang in Hebei. By 2016, the average concentration of airborne particulates with a diameter of up to 2.5 micrometers in Jing-Jin-Ji had declined by 33 percent compared to the 2013 level, according to data from the Ministry of Environmental Protection. "The prevention and control of air pollution must be carried out by the three together. Each one dealing with its own pollution alone is inefficient," Zheng said. People in rural parts of Hebei as well as the suburbs of Beijing and Tianjin still burn as much as 40 million tons of coal every year for heating. "Only when the three parties jointly promote the use of clean energy and reduce the emissions from scattered coal burning can the air quality be significantly improved," said Chen Guoying, Director of the Hebei Provincial Bureau of Environmental Protection. According to Beijing's 2017 budget report, a total of 340.68 billion yuan ($49.65 billion) will be invested in the synergetic development of the Jing-Jin-Ji region, up 14.3 percent year on year. As an important point of Jing-Jin-Ji integration, the construction of Beijing's sub-center alone will receive investment of up to 4.2 billion yuan ($612.2 million). Aside from transferring functions not essential to the national capital to nearby regions, Beijing will actively push forward the planning and construction of an intercity railway network and capital region ring roads in the Jing-Jin-Ji region; add 100,000 mu (6,667 hectares) of forest for water resource conservation; coordinate efforts to prevent and control water contamination; guide the transfer of industrial projects to Hebei's Caofeidian demonstration area; and support the development of green industries in the Zhangjiakou-Chengde ecological function area, according to Beijing's 2016 government work report. "Tianjin will give priority to promoting the integration of the Jing-Jin-Ji region, take the initiative to embrace the major national strategy and strive to build a new platform for opening up both internally and externally," said Mayor Wang Dongfeng.